The 1955 Penn Yan Commander Aristocrat left the factory with her transom, topsides, decks and interior finished bright. She was painted ivory below the spray rails. By noon today RJ and I released my Commander’s hardware, as well as the seating, bracing in the bilge, steering, coaming boards, rub rails and spray rails. The good news is that we found neither soft wood nor rot anywhere. Even the undersides of the spray rails are solid. The finish, however, its beautiful patina notwithstanding, will be difficult to save, but we will try to save it before we strip it away. The painted topsides, transom and bottom are very much another matter. The paint, especially that hideous purplish blue bottom, must go. As always, I was suspicious that varnish had been replaced by paint as part of an effort to hide condition issues in the planking. Happily, as RJ noted once I had it about 95% clean, “Looks like we can work with that transom.” Yes we can. The planking, which is clearly original, is in excellent shape. The same holds true for the bottom now that we have it about three-quarters stripped. Patience, combined with not brushing stripper out like it is paint are the keys to efficient paint stripping. Trying to stretch the stripper is pure folly in my world. Patience means, “Let the stripper work.” I apply it liberally, almost as though I am frosting a cake. Indeed, I pour it from the can and spread it with as few brush stroked as I can. Then I leave it alone for at least half an hour, but even as long as an hour. Now it’s time to scrape? No. Apply more stripper on top of what is already there, and go away again. Our go-to stripper, Jamestown Distributor’s Circa 1850 Heavy-Bodied Paint and Varnish Remover, has softened the paint down to the wood by now. It’s time to begin scraping, in our case, with a BAHCO scraper, rolling the material off the surface. We complete the task using ordinary stainless steel kitchen pot scrubbers purchased from a local super market. Apply a thin layer of remover, begin scrubbing with the grain immediately, and watch the residue disappear. 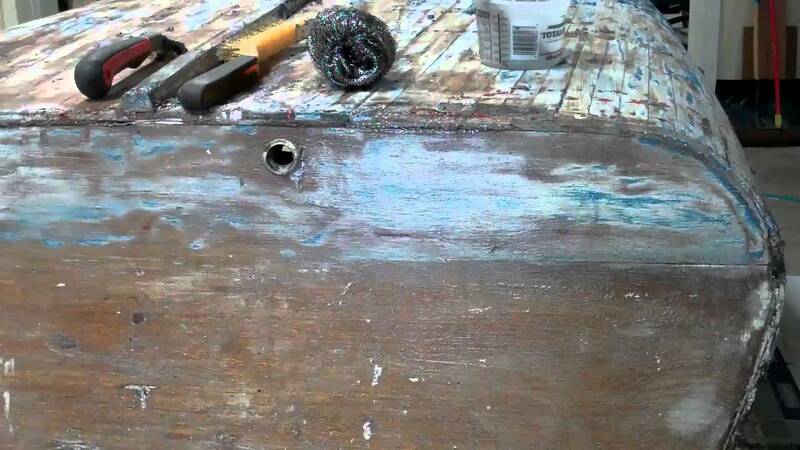 To be sure, nothing about stripping paint or varnish is glamorous, except being done. Previous PostPrevious 1952 Chris Craft Riviera Runabout 18 Wow!